Humor or horror? You decide, as sports atheist Walter Witty renders a play-by-play account of America's own most radical of religions: sports obsessions. From the hundred million plus salaries of sports gods to the games played by politicians and televangelists, Witty whistles and points at both Icons and Emperors prancing in their skivvies. Whatever their faith, he has choice words for them and their stories, while telling his own - including a Lossary of Terms. Sure to enrage or delight, The Umpire Has No Clothes is for anyone wanting to escape their crumb-strewn couch, or for the spouse who hopes they might. What made the experience of listening to The Umpire Has No Clothes the most enjoyable? Strap in for an enviable volley of pop culture metaphors while Walter Witty—the alter ego of Jonathan Lowe—rips, slams, tackles, and punts our world of professional sports worship through the broadcasting voice of Barry Abrams. Told with a Douglas Adams flare (and abundant references to that Galactically famous five-book trilogy), Walter even offers a brief look at an interplanetary twelve-step program for sports addiction. From the football gridiron to the baseball diamond, the Olympic stadium to the boxing ring, the competitive eating dinner table to wildebeest plains of Neanderthal March Madness, no sport is spared Walter's helmet-cam view (the next step in game-day coverage?). Short at 2 hours and 40 minutes, this is a good filler book for the end of your Audible billing month while you wait for your next full credit to arrive. What other book might you compare The Umpire Has No Clothes to and why? Douglas Adams - The Hitchhiker'sGuide series, only a much smaller universe. Yes, at 2 hours and 40 minutes it's a single-sitting (or in my case, a single-bike-ride) listen. GREAT NARRATION, ESPECIALLY ON THE LIE DETECTOR STORY. A "MUST LISTEN" FOR ANYONE AMUSED BY THE FANATICISM OF SPORTS FANS. 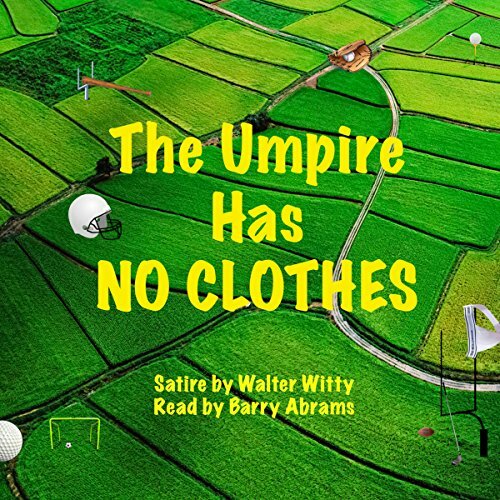 Where does The Umpire Has No Clothes rank among all the audiobooks you’ve listened to so far? Decent. It isn't the greatest of satire but it holds it's own. It does point out the ludicrous love obsession of America with sports in general in a humorous but poignant way. Would you be willing to try another book from Walter Witty? Why or why not? Probably. If it was on a topic I was interested in. If you could give The Umpire Has No Clothes a new subtitle, what would it be? Would you consider the audio edition of The Umpire Has No Clothes to be better than the print version? I haven't seen the print version. What does Barry Abrams bring to the story that you wouldn’t experience if you just read the book? Barry's narration was just fine - an appropriate voice for this book. Well, I'm not really a sports fan and so sometimes I miss the nuances and charm of sport-related humor, but I think this book can appeal to those who feel outside the athletic milieu. I found this book both entertaining and humorous. Well, written and clever in its witticisms.